6 New Kids on the Block! 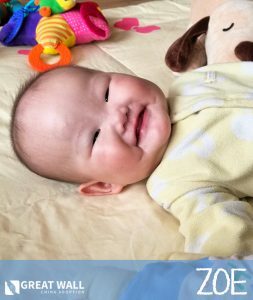 Zoe is a precious baby girl from China that just turned 1 year old. Zoe has been living with a foster family since she was 7 months old, and they are very attentive to her. Zoe has a ready smile and loves to be cuddled by her foster parents. She is babbling and can make many sounds. Zoe can sit up and will reach for nearby toys. She has good hand-eye coordination and good hand strength. When she is playing on her mat, she will kick her legs a lot. Also, she is rolling over by herself now. Zoe has post-operative myelomeningocele of lumbosacral lipoma type and post-operative tethered cord. If you would like to learn more about Zoe, please contact the GWCA China Home Finding Team today! 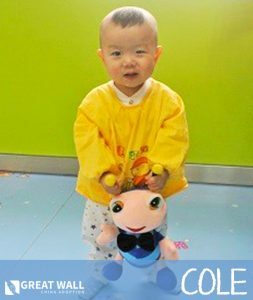 Cole is a precious little boy from China that just turned 2 years old. Cole is described as having a sunny personality and a ready smile. 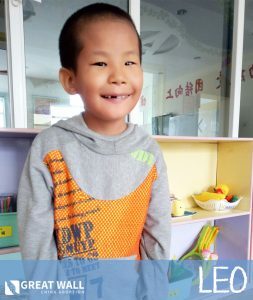 Cole was abandoned when he was a year old and was then placed in a simulated family at the orphanage, which is basically a foster family, but they’re just living in a small house or apartment on the orphanage grounds. Cole is very close with his foster mother and enjoys spending time with her. He will imitate when she speaks to him and will make noises accordingly. If she calls his name, he will smile and hold out his arms for her to pick him up. Cole can follow simple instructions such as as “come give me a hug and kiss” and “put your shoes away.” He seems to have normal cognitive and developmental abilities for a child his age. Cole does well socially and gets along well with other children. Cole’s favorite toys are balls, and he likes to toss them up and throw them. He has very good fine and gross motor skills. Also, he can walk on his own. Cole can pick up small objects, such as a piece of paper, and can then tear it with his index finger and thumb. Cole lives a relatively normal life. He has CHD, specifically an aortic arch coarctation (mild), and right main bronchial stenosis. If you would like to learn more about Cole, please contact the GWCA China Home Finding Team today! 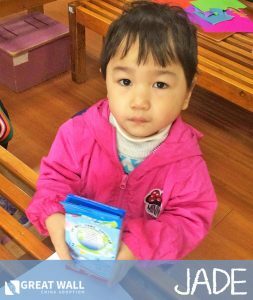 Jade is a beautiful little girl from China that just turned 5 years old. Jade was born with arms and legs that were malformed. However, after several successful surgeries and physical therapy, Jade can now walk on her own without assistance and can use her hands and arms normally. Her arms are a little shorter than some of her friends, but she can use them just fine. Jade can feed herself and change her clothes by herself. She can draw lines, circles and a person. Jade can catch and throw a ball and loves to play outside. Her favorite toys are dolls and building blocks. Jade is said to be very well cognitively and is on the same level as other children her age. She has good verbal skills and will ask “how” and “why” questions on her own initiative. She knows the difference between different colors, big and small sizes, and male and female. Jade is described as being shy and introverted. She is close with the other children in her class at the orphanage. Jade was abandoned when she was just three days old and was placed with a foster family soon after. Because of her specific needs, when she was 4 months old she was sent to the orphanage, so she could get the medical care and the physical and occupational therapy she needs to thrive. She now continues to live at the orphanage and is developing well. If you would like to learn more about Jade, please contact the GWCA China Home Finding Team today! She is a precious 7 year old girl with Down Syndrome. Edie is a sweet, shy kiddo who is described as being very calm and kind. She loves music, dancing, listening to stories, and reading picture books! 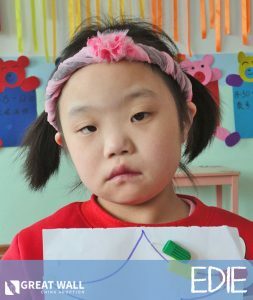 Edie is able to communicate well with teachers and caregivers and can clearly follow instructions. She is shy but loves to play with other kiddos when they are laughing and having fun! She has excellent mobility development and can walk and run without assistance. She also has amazing fine motor skills and is able to hold pencils and paint her name and simple characters. She is an adorable kiddo who needs a forever home! Please reach out to us at GWCA to learn more about Edie! This beautiful girl’s name is Viola, and she is 5 years old! Viola has nystagmus of both eyes, as well as vision impairment. She is a bright, happy girl who loves to help others. Her caregivers describe her as “sunny, active, and restless.” She loves to give hugs and is very attached to her caregivers at the orphanage. She will help her teachers put up toys and clean, and she loves to brush the hair over other girls in the institute. Viola is very exploratory and loves to learn new things! She will grasp new objects and pull them close to her eyes to try to see. She has a very strong light sense and is able to navigate the orphanage and find her favorite things easily! She has great mobility and can walk over obstacles if she is in a familiar environment. She can go up and down stairs easily and can jump on to the ground with both feet! She is a very brave little girl who does not let her vision impairment slow her down. She can speak several sentences and likes to greet caregivers and teachers. She is very kind towards others and likes to share her snacks with other children. She is described as being tidy, polite, and patient. When she is upset she will cry softly, but a hug from a caregiver makes her feel much better. She is a precious little girl who would thrive with the love of a family. 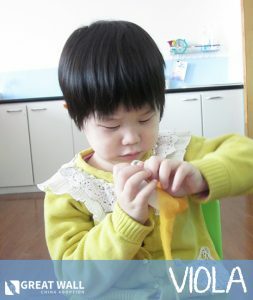 Please reach out to the GWCA China Home Finding Team to learn more about Viola! Bella is an adorable girl who just turned one year old. Bella was born with congenital heart disease and has not yet received a heart surgery. Her file states that she also may be cognitively delayed due to a lack of oxygen to her brain, but her growth report indicates that she is developing very well for her age! Bella is very interactive and outgoing, and she loves to giggle and play! She is able to differentiate between caregivers and strangers and has formed healthy attachments with the nannies at the orphanage. She tracks movement well and can babble to express her needs. Bella can recognize her name and will turn when called. She is also able to crawl forwards and backwards and can stand with support! Bella has amazing fine motor skills and is able to grasp her favorite toy. She is an active, loving kiddo who would thrive with specialized care and treatment. Please reach out to us at GWCA to learn more about Bella!